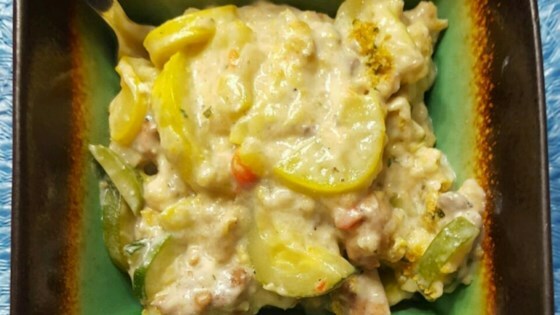 "I've tried many squash casseroles, but this is by far the best I've ever had. This recipe was given to me by a friend and has gotten rave reviews from squash lovers and squash haters alike. Fresh squash, bell pepper and onion are given an extra boost of flavor and texture from cornbread stuffing mix. This is a lightened-up version of the original recipe, but you won't miss a thing!" Preheat an oven to 300 degrees F (150 degrees C). Grease a 7-inch casserole dish. Melt the butter in a skillet over medium heat. Stir in the bell pepper, onion, zucchini, squash, and chicken broth. Bring to a simmer, and cook until the vegetables have softened, about 10 minutes. Use more broth if needed to keep the mixture moist. Remove the vegetables from the heat, and stir in the condensed mushroom soup, sour cream, and 3/4 of the stuffing mix; pour into the prepared casserole dish. Sprinkle the remaining stuffing mix over top. Bake in the preheated oven until browned on top, about 30 minutes. This recipe has a lot of variations. I love to use red bell pepper during the holidays to make it more festive looking. You can also use different kinds of squash, soups and stuffing mix based on what you have on hand. This is a easy and tasty recipe... I added some cheddar cheese. This recipe was awesome! I used all yellow squash because it's what I had on hand, and it was delicious! Hubby loved it! Loved! With all the squash i have in my garden i needed a new idea. This was easy and good as is. YUM! I really enjoyed this. I used butternut squash instead of the yellow squash, and it was very good! My one year old wont eat any veggies. I made this without the red bell pepper and I added some chicken and he actually wanted seconds! This is a great recipe.